Quick and easy guide on how to cook butternut squash in the oven. 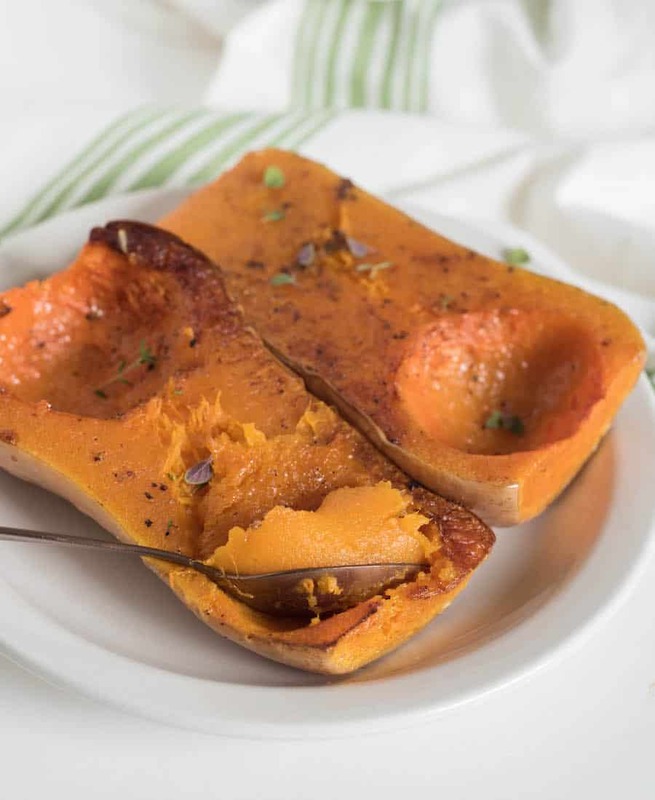 You can use the roasted squash as a side dish or in recipes that call for pumpkin puree! Butternut squash is one of those things that I come back to again and again when I want to feed my family healthy food. It’s sweet, simple to prepare, my kids love it, and it’s good for you! Have you seen the color of it?! If you are trying to “eat the rainbow” a little more, this beautiful, bright orange vegetable is a great place to start. I normally grow and store butternut squash from my garden. This year I ended up with a million spaghetti squash and only a handful of butternuts so I stocked up when they were on sale at the grocery store and keep them in my cold storage just like I do my home-grown squash. That’s one of my favorite qualities of winter squash like butternut – they last for ages after you buy them, unlike a lot of other produce. I like to roast butternut squash by cutting in it half, removing the seeds, and keeping the skin on. This method lends to very creamy butternut squash that is ready to be scooped out of the skin and mashed. 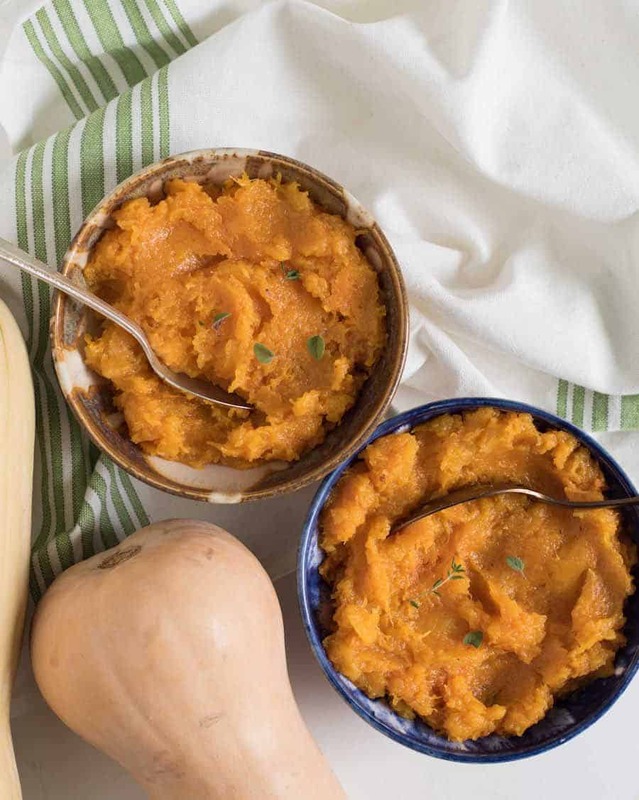 I serve the smashed squash like mashed potatoes as a side dish most often but you can also use it in place of pumpkin puree, potatoes, or sweet potatoes in most recipes. I often add it to soup and chilis, too, to thicken them. 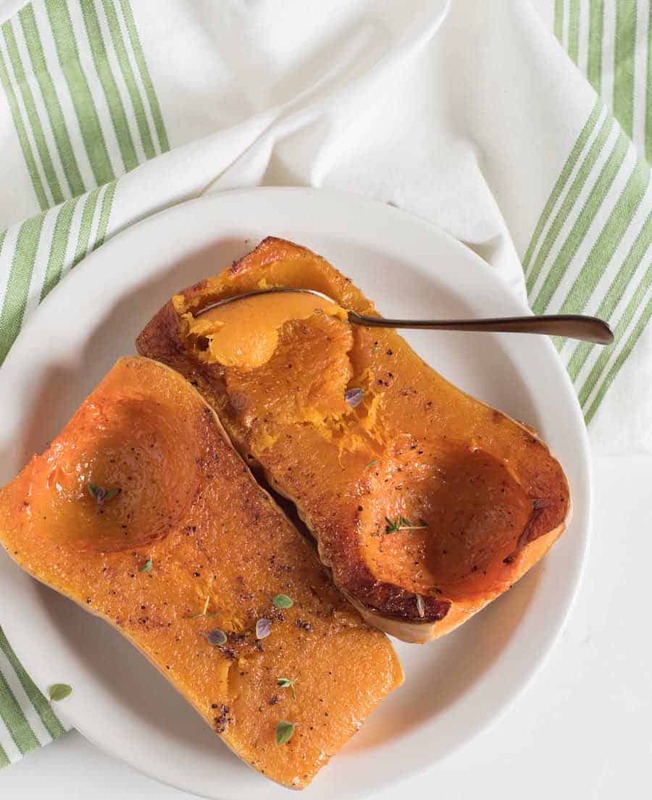 So many things to love about roasted butternut squash. It’s simple, quick, and one of our favorite side dishes. When buying butternut squash, be sure to get squash that are firm and blemish free (no nicks or bruises). It’ll store a few weeks (even months) so feel free to stock up when they go on sale. 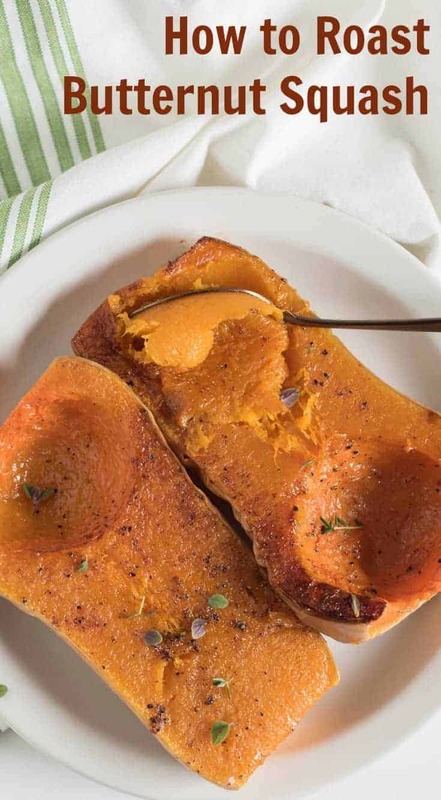 There are so many ways to eat and serve this simple roasted butternut squash. I think it’s really pretty to serve the squash right out of the skin with a few fresh herbs and a little butter on top. You can also mash it up with a touch of butter, salt, and brown sugar. 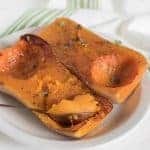 Feel free to use it however you would pumpkin puree, potatoes, or sweet potatoes (it makes a great topping for Shepherd’s Pie, and you can add smashed squash to your favorite pumpkin waffle recipe in place of the pumpkin). You can also use it in your favorite soups. Parchment paper makes cleaning this up a breeze. I highly recommend it. Or you could use a nonstick baking mat, though you’ll have a little more scrubbing to do. Line a rimmed baking sheet with parchment paper or tin foil and preheat the oven to 375 degrees. Rinse off the outside of your squash and then cut it in half from top to bottom. Scoop out the seeds. Drizzle the inside of both pieces of squash with olive oil and give it a generous sprinkle of salt and pepper. Place the squash on the prepared pan, cut side down, and add the water to the bottom of the pan. (Just pour it around the squash). Place in the hot oven. Roast for 40-50 minutes until the squash is easily pierced with a fork or the tip of a knife. Remove from the oven, allow to cool slightly, then scoop flesh from the skin. You can serve the squash as is, scooped straight from the skin with a little salt to taste. You can add it to a bowl and mash it with a little butter and a bit of brown sugar, or you can use it like you would any potato, sweet potato, or pumpkin in recipes. Seriously though, how pretty is that squash served right in its own skin? One of my favorite things to do as a hobby farmer is to honor the vegetable how nature/God made it. I think there’s a lot of beauty in the shape of things in their more natural state. Plus, my kids love digging in and scooping out their own squash for dinner. I think it reminds them of pumpkin carving. Now that you know how to roast a butternut squash you can serve it with a simple side salad (this winter salad and this fall salad are both great) and something like baked brined chicken breast or easy grilled pork chops. Nothing too hard but so much deliciousness to be enjoyed. Happy eating from my kitchen to yours.